God’s provision. All that Ruth and Naomi had been searching for, God provided. Read Ruth 4:13. Naomi had felt alone and abandoned. Ruth had followed Naomi home and learned about a God that she didn’t know before. A God who provides. A God who sees our needs. A God who knows us better than we know ourselves. And now, Ruth not only has a husband, God has enabled her to have a child. 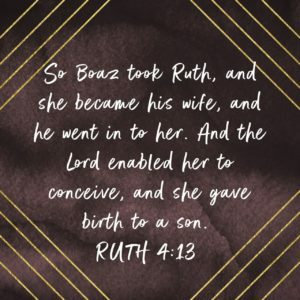 Remenber, Ruth had been married before for years and did not have a child, so the fact that God allowed her to conceive and give birth to a child would have been the ultimate sign of God’s provision to her. God provided Boaz, who was the right relationship at the right time, and now God has used Boaz to make everything complete in such a way that God was glorified through the entire situation. Are we trusting God to provide for us in every situation? To seek Him with our deepest needs? Ruth and Naomi did, and God provided.